As we head into 2019 with unsure expectations of the market, I thought it would be opportune to reflect on 2018. 2018 was another good year at XTB. Eight XTBs matured returning over $32 million in bond face value payments to investors – one of the unique aspects of investing in a maturing XTB. It might seem odd to say that we are happy to have maturing product, but this reflects the predictability of bonds. And those clients who invested in our fixed-rate bonds did very well. To help clients find another suitable XTB to reinvest in, we also added 10 more XTBs (fixed and floating rate) to our range during the year. These latest additions take our maturities all the way out to 2027. 2019 promises to be an even bigger year for face value payments to our clients – with $72 million due to be returned. Face Value of over $32 million returned to investors. Last year the RBA didn’t move the cash rate. In fact, it has been on hold since September 2016, a total of 28 rate decisions. The Australian bond market had a good year, the Composite Bond Index’s total return was 4.54%, and the total return for the Credit Index was 3.93%. the Brits apparent inability to find a Brexit solution, to name but a few. The ASX200 fell by 6.90% and the ASX200 Accumulation Index (price movement including dividends) fell 2.84%. Locally, the Australian economy had its own issues weighing it down – unease over the Royal Commission into banking coupled with state and federal political infighting. Meanwhile the correction in the housing market and continued wage stagnation challenged investor confidence. APRA’s Monthly Banking Statistics data indicates household debt levels of around $1.7 trillion. Almost $1 trillion more than in June 2007. Australians have more in household deposits than ever before – current levels of $925 bn are close to three times June 2007 levels. Based on these figures, our actual household deposits to household debt as a percentage, has risen by 0.1% (lower LVR). Australians now have more debt than ever. BUT, they also have more savings and a larger percentage of their money in savings. Recently AMP’s Shane Oliver stated that he expects the RBA to cut rates twice in 2019. This came as a shock to a lot of people. 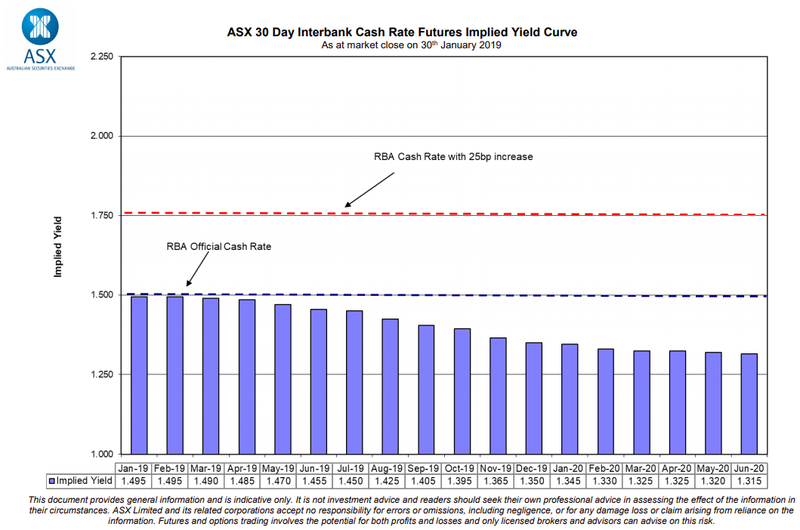 The current RBA Interbank Cash Rate Futures show the market pricing in a rate cut, with a 74% chance of a cut by June 2020. The current implied government bond yield suggests that we are going to be lower for much longer than anyone anticipated even a year ago. We continue to grow both the range of XTBs and our FUM. Our FUM currently sits at around $340m in just over 3.5 years, and more than $500m has been traded in XTBs since launch. We expect 2019 to be an important year for us, and hope to be making some exciting announcements. First Series Maturity Ladder (S1): 4.60% p.a. Second Series Maturity Ladder (S2): 4.79% p.a. Third Series Maturity Ladder (S3): 3.43% p.a. Monthly Income (Floating-Rate Notes): 2.79% p.a. Concentrated High Yield: 5.61% p.a. XTB No. 1 SMA: 4.69% p.a. Read more about ACBC Fixed Income No. 1 SMA or the ESG Fixed Income SMA. First created on 30 August 2016, the aim of the portfolios is to help advisers create portfolios to meet different client needs. Chart 1 shows performance of our recommended portfolios since 31 December 2016. 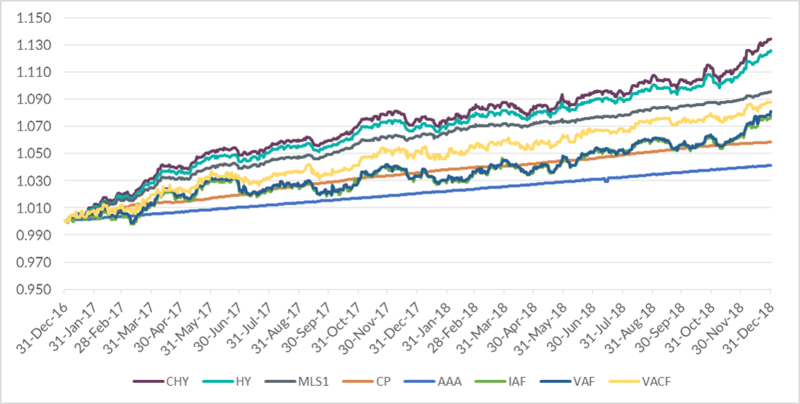 We compare our Concentrated High Yield (CHY), High Yield (HY), Maturity Ladder S1 (MLS1) and Monthly Income (CP – previously known as Cash Plus) portfolios to AAA, iShares’ IAF and Vanguard’s VAF and corporate bond ETF, VACF. Over the 24-month year period, the 3 XTB fixed-rate portfolios outperformed the other fixed-rate bond ETFs. The floating-rate XTB Monthly Income portfolio outperformed AAA. Remember, when selecting XTBs or a bond fund or ETF, the key benchmark for investors is the expected Yield to Maturity after fees. Yield to Maturity is a forward-looking number that shows what you are expected to earn if you hold to maturity. But importantly, this key number is something you never know in a fund or ETF, as they don’t mature – they are perpetual. Something else to consider is that fund and ETFs don’t show the yield to maturity after fees. You need to deduct the fees to get closer to their real Yield to Maturity. In contrast, all XTB Yield to Maturities include fees – you know exactly what your return will be if you hold to maturity (subject to no default). Read more about how XTB fees are charged. Please call me on 1800 995 993, to discuss which XTB portfolios could work for you and your clients. I would be happy to create a personalised cash flow PDF for you which you can use to discuss XTBs with your clients at your next review meeting. Disclaimer: The performance chart and table above is for illustrative purposes only; it does not constitute investment advice and is based on data from sources believed to be reliable. This chart is only made available to professional investors within the meaning of section 9 of the Corporations Act, it should not be provided to any person who is considered a retail investor within the meaning of section 761G of the Corporations Act. This chart is based on certain assumptions, as set out below. We use Bloomberg Cumulative Total Returns (Gross Dividends) for all non-XTB funds. The theoretical XTB Concentrated High Yield portfolio uses the original constituents from the portfolio start date on 30 August 2016, all data, including for the period prior to the XTB Concentrated High Yield portfolio start date, is sourced from Bloomberg using the Underlying Bond prices, plus the securities manager’s margin (fees). As such, it may not represent transactions that are capable of execution at any particular point in time. All other data is sourced from Bloomberg, using the published unit price (after fees). Past performance is not a guarantee of future performance.